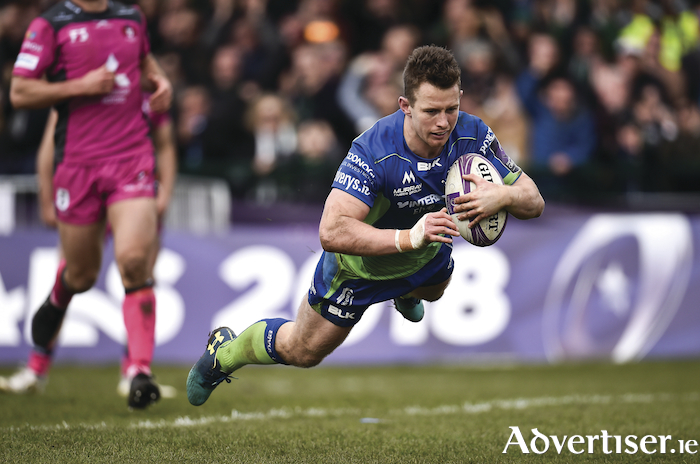 Connacht, having been forced to relinquished any remote hope of attaining a Champions Cup place, now must summon all their pride to face top-of-the-table Glasgow Warriors in Scotland this evening (7.35pm ). It is hard to imagine anything other than a home win - all the momentum is with Dave Rennie's side as they try to maintain their top spot with Munster close behind. And while coach Kieran Keane will not lack motivation when coming up against his "old boss" from the Chiefs, rallying the players may be a little more difficult after licking their wounds this week. Keane was blunt in his summation of the 39-10 Liberty Stadium defeat, saying his team probably got what they deserved - "far too many mistakes, basic errors, fundamentals, an horrendous night for us" - but maintains his side does not lack effort. "We do try, but if we are as inaccurate as we were [against Ospreys] in most facets of the game, we are always going to struggle." There were some mitigating factors - not least what Keane described as a hangover from the Gloucester defeat which had taken a toll physically and mentally - but that will not wash for a second successive week. Games have always been closer between these sides, and win or lose, a performance of substance is needed tomorrow evening. Forwards coach Jimmy Duffy maintains Connacht will fly out today with a mindset to win. "We are preparing to try to beat Glasgow at the weekend. It will be a huge challenge, and after their loss at the weekend, they will be gunning for us, so it's going to be a competitive fixture. "We have been within range of a lot of teams this year which shows we are competitive, but we are looking for continuous improvement, and that is the driving factor. We need to express ourselves and realise our potential." Duffy says Connacht need to take the positives from this season, particularly the introduction of some young players, such as Peter Robb last weekend. "You can't buy experience, and that is what we are really driving at the minute. So to play in that pressure cooker environment against players of that calibre in Glasgow is what it is about." Duffy accepts expectations have not been met since winning the PRO12 trophy two seasons ago. "In the last couple of years the expectation has been very high, but we have had players leave the club, players come into the club, a number of young guys coming through, so it is evolving. We had never been in that position before, never won a trophy, or transitioned out so many players; never had a pre-season with seven out on international duty. "That was a massive learning for us, and I believe we will be the stronger for it. It will take some time, and I can understand supporters may be frustrated, but I think people have to see what is coming, where we are going, and some of the performances we have put together."